Americans have experienced a resurgence of interest in old crafts and techniques, intrigued by the quality and individualism of handmade objects. Blacksmithing is an art that was practiced in nearly every town and hamlet in the United States. Here at Lamberton we have a unique opportunity and are working to preserve a part of the community's heritage--the Hanzlik Blacksmith Shop. The building affords the opportunity and experience to view what is described as a gathering place of the community. Many came here to have horses shod, learn the events of the day and to share some good natured kibitzing. 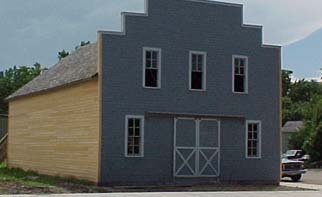 The Hanzlik Shop has been a blacksmith shop in Lamberton since 1895 - 1897. As far as information the society has been able to gather, this building was built by George Nigg Sr. and Paul Schaffran and they purchased some needed tools from an "old timer." They in turn sold this shop and its contents to Anton Hanzlik and in 1920 his son. George "Gabby" joined him in the business. George continued the firm with the interior and exterior virtually intact until he slowed down about 25 years ago, but continued to visit the shop daily until his death. All the tools are intact, the wooden floor has shown wear as many horses walked over the interior and many plow shares were laid on the floor after sharpening their points. The forges were modernized over the years in that electricity was used to blow air on the coals. All the tools are intact, the wooden floor has shown wear as many horses walked over the interior and many plow shares were laid on the floor after sharpining their points. The forges were modernized over the years in that electricity was used to blow air on the coals. One anvil has been repaired after it was broken by a heavy sledge hammer. An English anvil remains intact adjacent to the forge area where the ssmithy pounded the hot metal in the desired shape.There are numerous pieces of machinery used to make wagon wheels and spokes, Some pieces of machinery no one has been able to identify nor can comprehend what they were used for. It is a warehouse of a long-ago lost art. The Lamberton Area Historical Society invites you to this National Treasure!